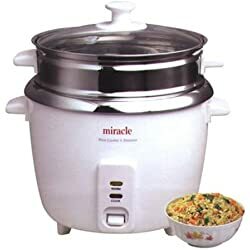 This Miracle stainless steel rice cooker (by Miracle Exclusives) was almost the perfect rice cooker. First, let us state that this is indeed an all stainless steel rice cooker. Both the inner pot and food steamer basket are made of stainless steel. Now whether or not this is solid stainless steel or coated stainless steel, at this time, at least to us, remains unknown. But according to Miracle Exclusives.com, it states in the product description that it is a “solid mirror finish”. For folks who are searching for a healthy rice cooker and want to stay away from Teflon cookers, along with the Sunpentown SC 886, this Miracle stainless steel rice cooker is a good choice. As mentioned above, this rice steamer cooker has both a stainless steel rice pot and steaming tray. It is easy to use thanks to the one-lever operation and will complete a batch of rice just as fast as any other cooker of this basic type. White rice comes out to a good standard, but brown rice, jasmine rice, mixed, etc. does take more of a learning curve to perfect. For brown rice, soak 20 to 30 minutes before starting the cooking process for better results. However, please note that this is not a non-stick cooker so clean up will be a bit more of a chore. What we found people like about this cooker is that it also allows the user to steam food while the rice is cooking, a neat little additional benefit that makes this rice steamer cooker great for completing entire healthy meals all in one unit. Its 8 cup size will produce around 24 cups of cooked white rice. The Miracle stainless steel rice cooker comes with a stainless steel pot, steaming tray, measuring cup, and rice paddle. Once the rice is complete, the unit automatically switches into a “keep warm” mode that holds the rice at an ideal ready to serve temperature. Some recurring complaints we gathered are mainly the sticking issues, along with the common spill-over issues along with rice crusting issues on the bottom layer. To help avoid sticking, some users suggest to let the rice steam in the keep warm mode for 10 minutes to help loosen the bottom layer a bit. This also develops fluffier rice texture! For the spill-over issue, try using a piece of aluminum foil as a temporary lid since the small steam hole vent allows excess pressure to build creating the starchy water to “bubble” and cause spill over. Use Caution When Placing/Removing the Lid! Folks can also try using some powered chicken seasoning and a bit of cooking oil should they prefer not to remove/replace the original lid with foil. To conclude our review, some things this cooker could have used was a better sealed lid, and also a micro-computerized design allowing for higher rice quality, timer options, specific rice grain settings, and slow-cooking benefits. Other than those few little upgrades, along with a balanced mixed of pros & cons, overall we have found this to be a good stainless steel rice cooker.